Does your city have a symbol? Living in Toronto, I survived the city’s attempt to brand itself with multiple sculptures – the city choose moose. At the time, I had no idea how the moose connected to the city of Toronto – and to this day, it was an oddity that soon faded. Occasionally you may see one of those artfully decorated moose, still standing, although not part of any promotion of the city. In New Orleans, its a city with many symbols – the fleur de lis, Mardi Gras, the Saints and the images of jazz and music. But one of the most popular symbols and souvenirs are the Mardi Gras beads. No matter what time of year someone visits this city, there will be a moment where you’ll get some beads – even though its really only encouraged to be acquired during parades. So with the love for beads, this city now has bead dogs. 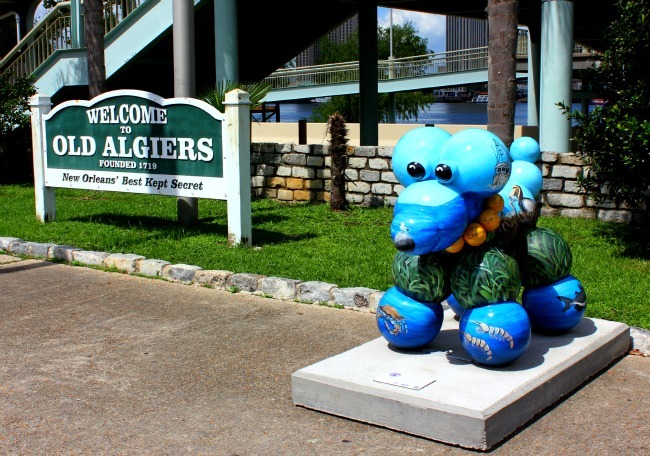 The tradition to transform beads into dogs has been a long time activity and now there are 45 sculptures throughout the city. But not just a pretty affectation to add some arts to neighbourhoods – these sculptures are in support of the local SPCA to raise awareness of the number of animals ending up at the shelter – Paws on Parade. The sculptures will be purchased by local businesses and organizations, with money going to the SPCA. The moose may have been an odd and apparently thought to be a lure to visitors, but the bead dogs hope to raise awareness and make sense as a fundraiser. Note to other cities – make the symbol integral – and it will work.